Last edited by Drifting; 03-02-2019 at 08:02 PM. This 3 part upgrade is focused on maximum weight reduction with everything titanium whilst retaining OEM PSE controls. for maxium weight loss, sure. But it would make the car far louder, which is exactly what I’m not trying to do. It'll just be a little louder and you can quiet it down with the Dundon quiet center muffler. not really a lot louder....under 4’ rpm driving around town is still stock quiet. I did the Soul Performance Side Muffler delete pipes and am extremely happy with Soul. maybe I’m confused. I thought the side mufflers included the PSE components, which controlled the volume to a degree. If you remove the side mufflers, wouldn’t the PSE always be on? Add a set of Dundon headers with cats. Not if you get valved ones. Sounds close to stock below 4K, animal above. To me the tone of the titanium RS muffler is a little softer and smoother than steel. 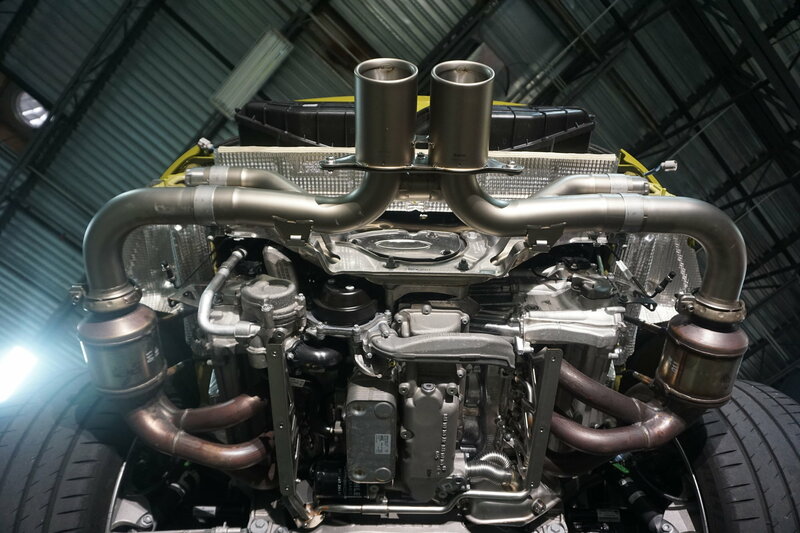 Akrapovic race center with link pipes, OEM cats and headers. No weight left to lose unless you get the titanium headers and 100 cell cats. It’s louder and on all the time but wife and I drove back and forth to South Miami (for DRT) from Palm Beach (160mi RT) very comfortably between 70-90mph and normal conversation was very easy. There is no drone, which is due to unwanted resonances within the cabin, but you do hear the engine all the time.